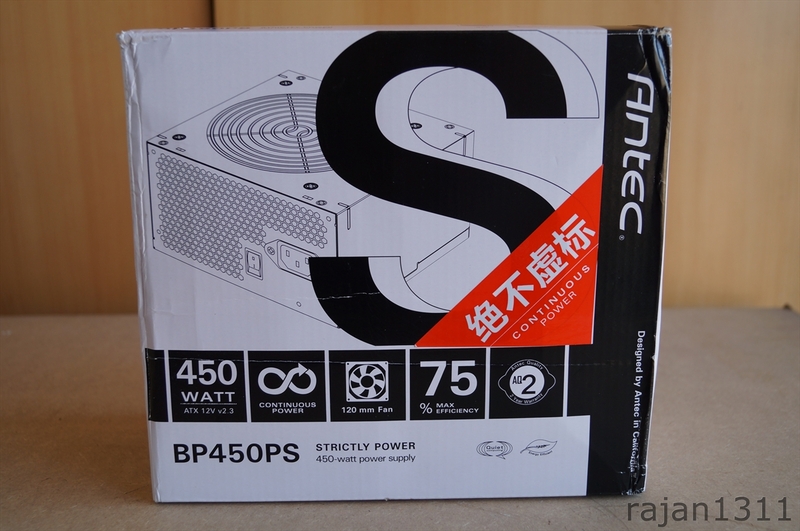 As expected with entry level PSUs, packaging was simple and nothing flashy. The box has some basic information about the PSU, however they did miss out on one thing – the protection features of the PSU. Its one of the things budget consumers would want to know. I actually could not find this anywhere – not on the manual or official site . Hope they put this information up somewhere, at least on their website. 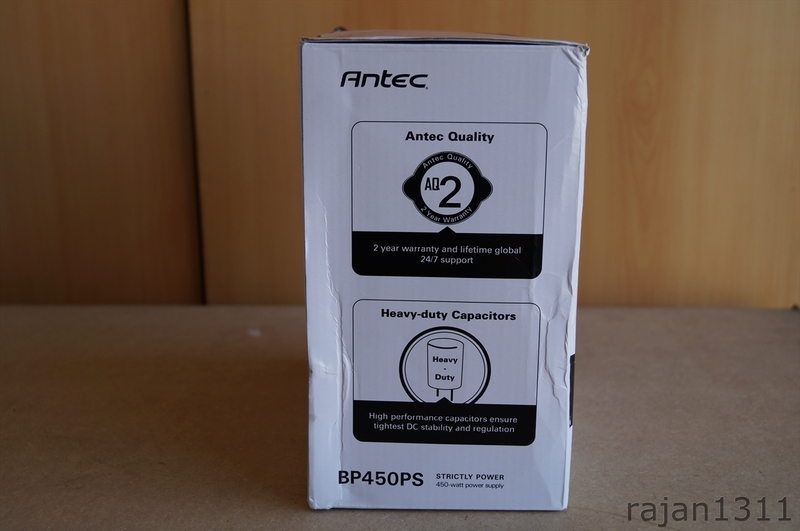 To run you quickly through some of the features antec boasts are the 450W of continuous power, high performance capacitors, CircuitShield (protections) and a 2 year warranty. 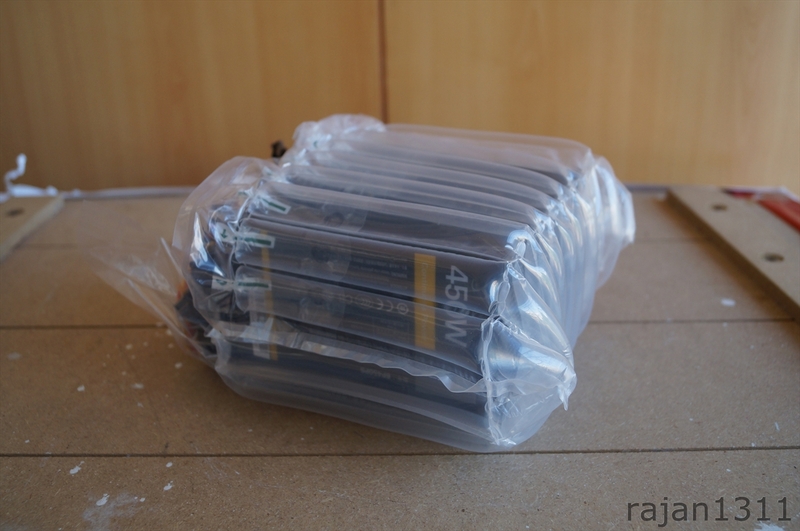 Inside the box we have the PSU safely concealed within a bubble wrap. 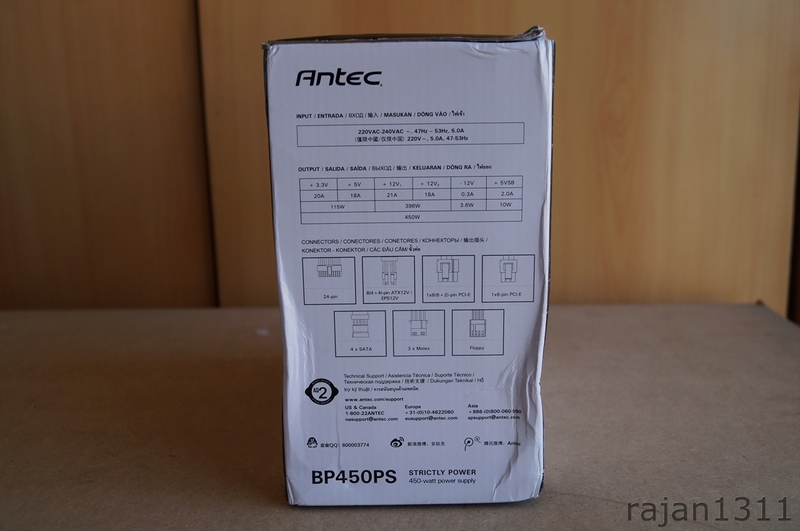 As it says at the rear of the box, the PSU comes with no power cable, so you will need to buy one, might cost in about Rs 50-100, so factor that in. The unit does look pretty good and the paint job is actually pretty nice. All the cables are un-sleeved, so they saved some costs here. To be honest, I don’t mind this at all. 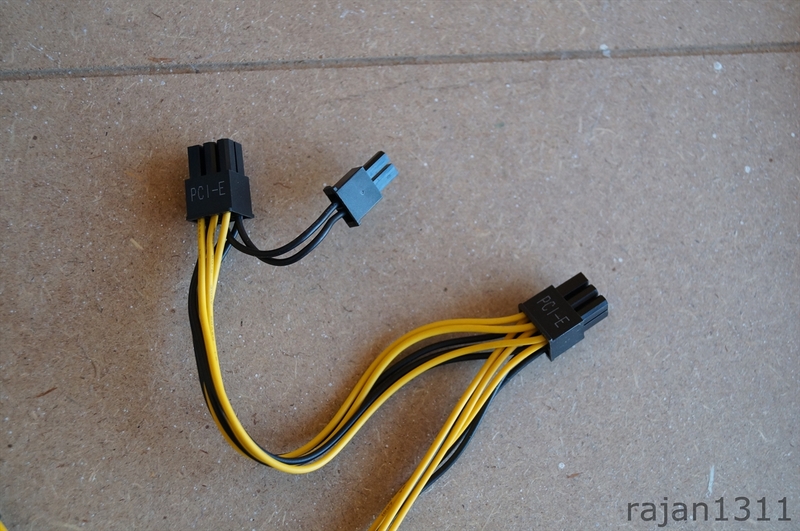 As one of the above pictures indicate, the PSU does have an 8pin and a 6pin PCI-e connector, however its on the same cable. 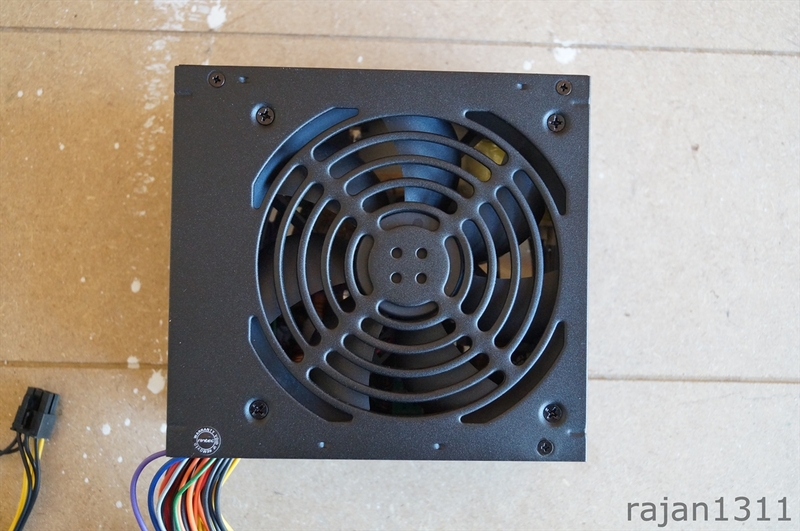 This is fairly common on entry level PSUs and you probably wont be using them together. You can see the PSU ratings on the side of the box as well as on the PSU. It uses dual 12v rails with a combined output of 396W. One of the things that manufacturers have been doing for products in this segment is over rate their power supplies. 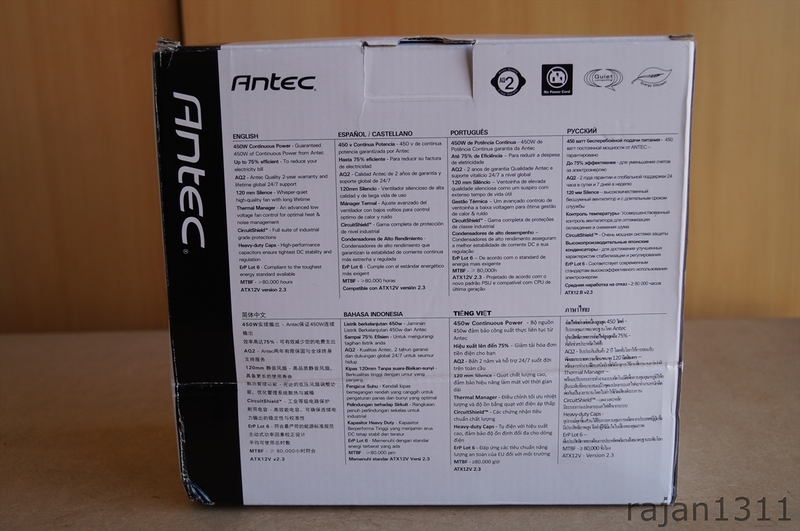 Its good to see antec not doing that, at least by looking at their specs. To explain my point, I got a cheap PSU that claims to be 400W, here are the 2 PSUs together. The PSU above got only 7A on the 12v rail, so it will probably poop out at about 70W! To a lot of users in india, PSUs are the most compromised component in a PC and a lot of it is down to the fact that they are very poorly understood. I don’t claim to be an expert, but here are some basic facts that you should know when shopping for a power supply. 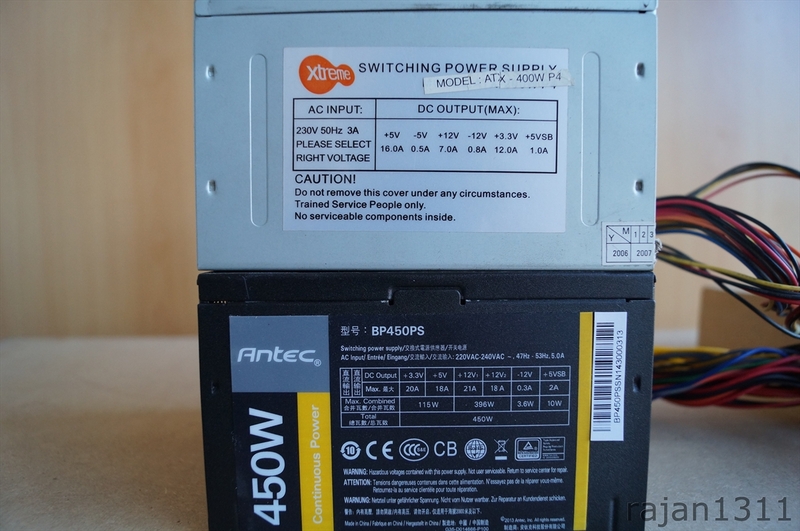 More watts ain’t always better – Its probably pretty obvious to most, but a lot of people still believe that a xyz brand 600W PSU is always better than a pqr 450W PSU. Clearly from the above image, there is nothing stopping companies from putting any numbers on them, so don’t go by the numbers. Power factor correction – Without any technical details, try getting a PSU with active power factor correction. 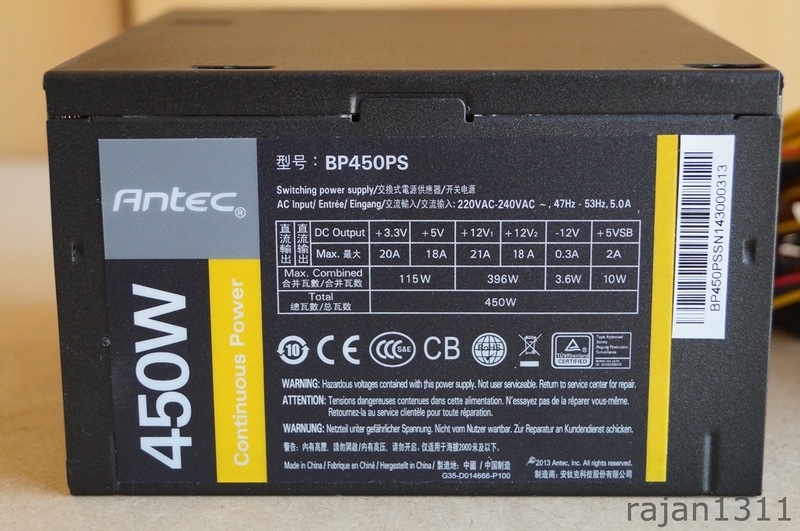 It really improves PSU efficiency and even many budget PSUs come with it. 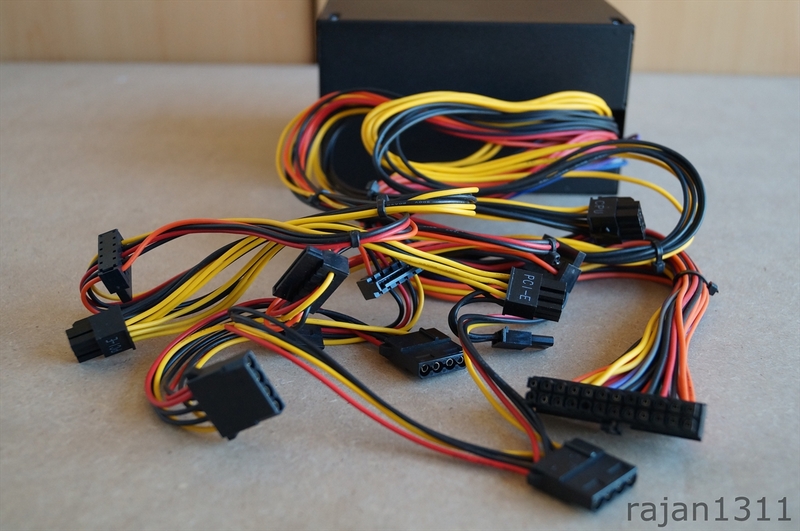 80 Plus rating – Its basically a kind of certification that the PSU meets some standards. Its always good to have one of these, but some lower end PSUs might now have them (but it is still possible that they have 80+ efficiency). Obviously there is a lot more to it, if you guys need any assistance, you can post a comment or go through some tech forums, you will most definitely find what your looking for. To sum up this section, there are some concerns I got with the unit. First off, this power supply uses passive power factor correction, which aint great. It will be an efficiency killer. There are power budget PSUs that come with active power factor correction, common guys, you could have done this. Second is the rating of the 12v rails. There are 2 different ratings (21A and 18A) suggesting that 2 different rectifiers are being used here. Now that’s not the problem, the problem is that the combined power is 396A – 33A. This somewhat suggests that the combined rating is limited by some other component and not these rectifiers. This could be the transformers or some other component. 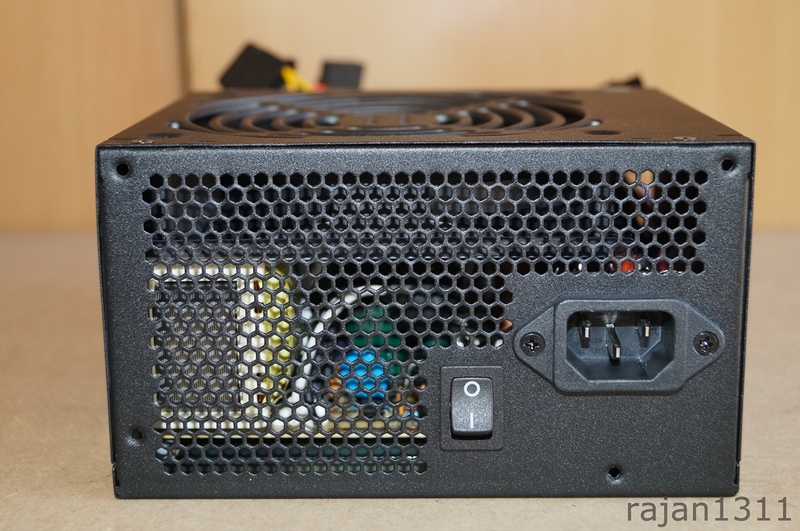 I am still new to PSUs, so I might be wrong on this, feel free to comment.